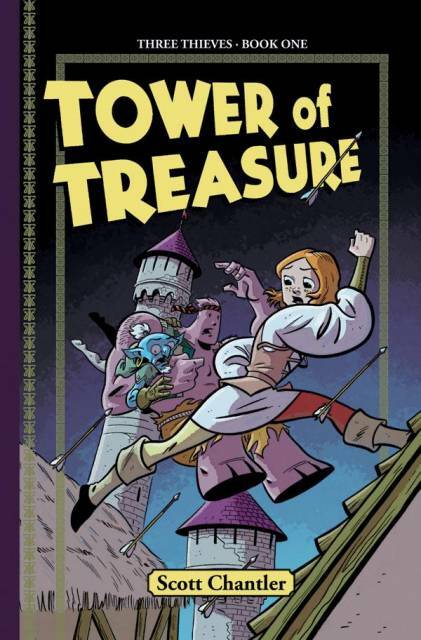 I’ve had my eye on Scott Chantler’s Three Thieves Book One: Tower of Treasure for a while now. It’s on the top shelf of my library’s kid-friendly graphic novel section and I found myself drawn to it thanks to the title (which reminds me of an Indiana Jones installment) and the young heroine on the cover. I like how she’s dodging arrows on her own, but also worried about the situation as a whole. Opening the book, I was treated to a tight cartooning style that reminds me of older newspaper strip artists but with a precise modern viewpoint. The clean coloring and composition of the book make it a big, bright, fun adventure on the whole even though there are several dark moments for our heroine and her pals to survive. Speaking of the heroine, her name is Dessa Redd and she’s an acrobat in a traveling circus along with her friends and coworkers Topper and Fisk. She has a mysterious past that involves a kidnapped younger brother that catches up with her during a performance that goes awry. Blamed by the circus folk for ruining their latest meal ticket, she decides to go along with Topper’s plan to rob the nearby treasure tower to make up for her earlier mistake. Given her acrobatic skills, she has relative ease making her way through the traps set up by the mysterious Greyfalcon, but the heist does not go off without a hitch and our heroes have to figure out a way to avoid capital punishment. I’m personally not a fan of faux-medieval fantasy stories, but this one sticks more to the real world adventure (traps, escapes, treasure) than the mythical which I appreciate. It’s kind of a mix of the aforementioned Indiana Jones vibe and something like Princess Bride. The fantasy motifs allow for more interesting-looking characters like Topper and Fisk, but don’t take away from the reality of the situation which is pretty serious for the titular Three Thieves. That’s also the biggest red flag of the book for parents. The main characters are threatened with hunger and death at various points and the Queen is an all around awful human being, but I would put this on the same level of your average Disney movie. Actually, while reading this book I kept thinking that it would make an awesome movie. I try not to get too far into that headspace when reading comics, because it’s not the point, but a live action version of this would be AMAZING, especially given the prominence of the young female character. I’d be stoked to take my daughter to see Tower Of Treasure on the big screen. Anyway, Chantler’s world feels so lived in and interesting that I just want more of it, which is good because I’ve got the second and third books sitting here waiting to be read! 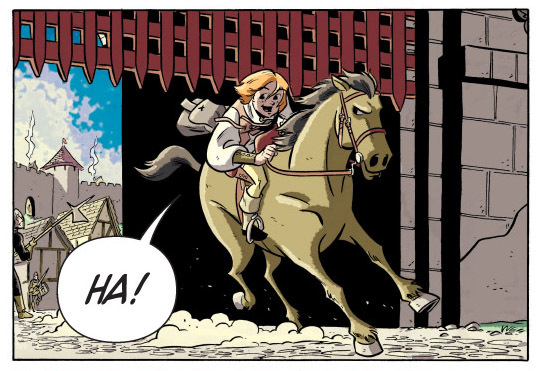 If you want to check out more about Three Thieves, head over to the official website where you can actually read pages from the story to see if it’s up your and your kids’ alley.